Essentially Tas- more accommodation options! Driftwood Cottages provide a diverse selection of deluxe self-contained accommodation options in the Huon Valley and Far South. The seaside towns of Dover and Southport are central to all the wonders of Tasmania's beautiful Huon Valley and region south of Hobart. Choose from our extensive range of accommodation- from waterfront studio apartments and cottages to ultimate luxury and seclusion, all designed to make the most of the stunning waterways of Tasmania's Huon Valley and Far South and just over an hour from Hobart! 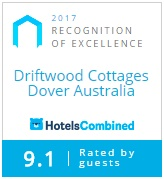 Whether you are seeking a luxurious getaway, a family holiday or a corporate retreat...Driftwood offers a range of accommodation to suit every need. Relax and enjoy your idyllic surroundings from your own private verandah; stroll along the sandy beaches or try your hand at catching a fish from the wharf just minutes from your door. Central to all the attractions of the Huon Valley, D'Entrecastreaux Channel and Tasmania's Far South, Driftwood makes the ideal base to explore the region. Enjoy the local delights of Dover, Southport and their surrounds including the Hastings Caves and Ida Bay Railway, and discover the rugged beauty and tranquillity of Tasmania's southernmost forests, waterways and wilderness. You may even be lucky enough to enjoy the beautiful spectacle of our Southern Lights from one of our cottages! Modern two bedroom cottages with private decks and expansive Bay views! Your own Jacuzzi under the stars, wood fire and stunning views over Port Esperance! Had a wonderful time with good friends in a place unsurpassed for beauty anywhere in the world. Thankyou! Just what the Dr. ordered. Wonderful peace and quiet and magnificent view. Black Swans, gentle stroll along the beach. Thank you. Take some time to read the reviews of our past guests and visitors to Driftwood Cottage and Far South Tasmania! Our online booking link allows your to browse rates and availability and book securely- or contact us if you need more information! Tasmania's Huon Valley and Far South offers a wealth of activities and attractions...explore some of our best kept secrets and discover why we think we have the best of Tassie! Check out our full range of unique accommodation options!